The brightly colored SH-A820 are main shoe style being pushed by VICTOR in autumn 2014. 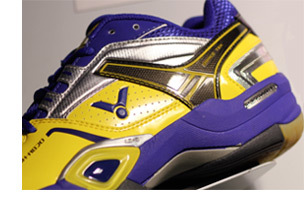 The SH-A820 is a professional badminton show unanimously recommended by players everywhere. The line design has a pronounced speed feel As well as the eye-catching colors, the designers have merged the tension and rhythm of modern architecture into the shoe, giving it clean lines and a pronounced speed feeling. 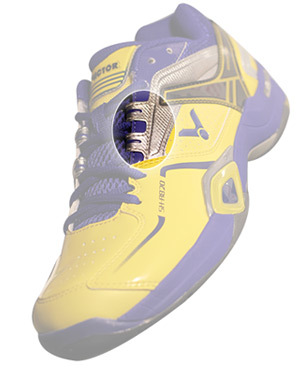 In addition, to fulfill the high functional requirements of coverage, stability, breathability and comfort, a large amount of money was invested to give players a premium badminton shoe that is both comfortable to wear and attractive to look at, but without having to pay a premium price. 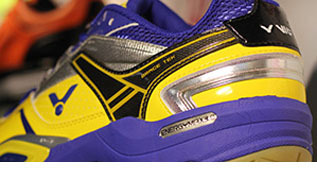 Whether judged on functions or on appearance, the SH-A820 is a value for money shoe so it is no wonder that many players, including Chinese Taipei’s Tai Tzu Ying, have made the SH-A820 their designated badminton shoe. The main selling points of the SH-A820 are comfort and coverage. The aim is that the wearer will enjoy a nice tight fit and a feeling like shoe and foot have become one when they move around court. This is the purpose of the AUTO FIT design on the inner and outer upper. In actual fact, AUTO FIT has appeared before in a VICTOR shoe, namely the classic SH-8600 once had this functional design. It is worth mentioning that the AUTO FIT on the SH-A820 has been upgraded in three ways to give improved coverage and comfort. In accordance with feedback by VICTOR’s contracted players and others who tried out the shoe, the VICTOR design team moved AUTO Fit forward to the 3rd and4th lace holes to give the wearer more complete coverage feel. The inner layer’sΠstructure uses a more soft and comfortable low-elasticity material so that when the wearer ties their laces they will feel nice tight coverage without an unpleasant feeling of pressure on the instep. The one-piece design of the inner layerΠstructure, laces holes and the upper leather provides more complete and more comfortable foot coverage. While pursuing good upper foot coverage, breathability was not something the VICTOR design team was prepared to sacrifice. On the inside and outside of the upper, holed breathable PU is used so that, even when the shoes are tightly covering the feet, the wearer’s feet won’t feel hot. Another feature worth mentioning is the upgraded Lateral Support System (LS-S.) To reduce discomfort when the wearer moves laterally the designers have used two diamond shaped discs that are soft on the inside and hard on the outside to form a new LS-S and, at the same time, increased the length of the diamond shaped discs to provide more lateral support area, effectively reducing impact when lateral movement occurs and also indirectly increasing the stability of movement of the wearer. 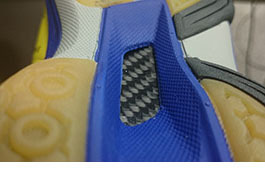 On the inside and hard on the outside to form a new LS-S and, at the same time, increased the length of the diamond shaped discs to provide more lateral support area, effectively reducing impact when lateral movement occurs and also indirectly increasing the stability of movement of the wearer. The use of two carbon fiber discs at the mid-foot and hard EVA on each side give the SH-A820 good foot arch stability and the metallic feel TPU strip around the heel and BraceTek on the outside and inside give the heel stability. The inner toe uses highly abrasion resistant material V-Durable while the tongue is sandwich mesh that is both breathable and comfortable. 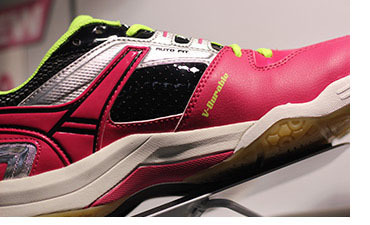 Behind the dazzling appearance of VICTOR’s all new badminton shoe, the SH-A820, for autumn 2014 there is high level functionality. For the SH-A820, conventional thinking about badminton shoe color has been turned on its head by using highly saturated colors to express a youthful image that is full of vitality. The shoe also features high-end technology and materials, the aim being to give the wearer a feel of comfort and all round coverage when they wear the SH-A820 on court. 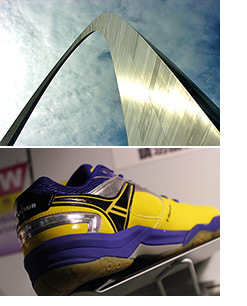 Want to acquire a premium shoe without paying a premium price? Then go to an authorized VICTOR distributor and try on a pair of these high C/P value shoes and we believe you will fall in love with them!